ab17347 gives a positive result against the immunizing peptide and a negative result against the corresponding unmodified peptide in ELISA analysis. ab17347 recognises histone H1 tri methyl K25 in HeLa nuclear and whole cell lysates at 35 kDa. The signal is efficiently blocked using the immunzing histone H1 tri methyl K25 peptide but not the corrseponding unmodified peptide or histone H1 di methyl K25 peptide. ab17347 also appears to recognise other bands between 34 kDa and 37 kDa, which are attributed to the antibody recognising other isoforms of histone H1. ab17347 also appears to recognise methylated histone H3 at 17 kDa. Synthetic peptide conjugated to KLH derived from within residues 1 - 100 of Human Histone H1, tri methylated at K25. Our Abpromise guarantee covers the use of ab17347 in the following tested applications. WB Use a concentration of 1 µg/ml. Detects a band of approximately 35 kDa (predicted molecular weight: 35 kDa). IHC-P 1/300. Perform heat mediated antigen retrieval before commencing with IHC staining protocol. Histones are basic nuclear proteins that are responsible for the nucleosome structure of the chromosomal fiber in eukaryotes. Nucleosomes consist of approximately 146 bp of DNA wrapped around a histone octamer composed of pairs of each of the four core histones (H2A, H2B, H3, and H4). The chromatin fiber is further compacted through the interaction of a linker histone, H1, with the DNA between the nucleosomes to form higher order chromatin structures. Linker histones are involved in the formation of higher order structure in chromatin and the maintenance of overall chromatin compaction. Histones are basic nuclear proteins that are responsible for the nucleosome structure of the chromosomal fiber in eukaryotes. Nucleosomes consist of approximately 146 bp of DNA wrapped around a histone octamer composed of pairs of each of the four core histones (H2A, H2B, H3, and H4). The chromatin fibre is further compacted through the interaction of a linker histone, H1, with the DNA between the nucleosomes to form higher order chromatin structures. Methylation of position-specific lysine residues in histone N termini is a central modification for regulating epigenetic transitions in chromatin. Each methylatable lysine residue can exist in a mono-, di-, or trimethylated state. Arginine resdiues can also by mono or di methylated. ab17347 recognises histone H1 tri methyl K25 in HeLa nuclear (lane1) and whole cell (lane2) lysates at 35 kDa. The signal is efficiently blocked using the immunizing histone H1 tri methyl K25 peptide (lanes3-4) but not the corrseponding unmodified peptide (lanes5-6) or histone H1 di methyl K25 peptide (lanes7-8). ab17347 also appears to recognise other bands between 34 kDa and 37 kDa, which are attributed to the antibody recognising other isoforms of histone H1. The strong signal at 17 kDa is attributed methylated histone H3. ab17347 staining histone H1 tri methyl K25 in female cerebellum, showing a distinct and strong staining pattern at cells in the granular and molecular layers. Paraffin embedded human skin tissue was incubated with ab17347(1/300 dilution) for 30 mins at room temperature. Antigen retrieval was performed by heat induction in citrate buffer pH 6. ICC/IF image of ab17347 stained human HepG2 cells. The cells were methanol fixed (5 min), permabilised in 0.1% PBS-Tween (20 min) and incubated with the antibody (ab17347, 1µg/ml) for 1h at room temperature. 1%BSA / 10% normal goat serum / 0.3M glycine was used to block non-specific protein-protein interactions. The secondary antibody (green) was Alexa Fluor® 488 goat anti-rabbit IgG (H+L) used at a 1/1000 dilution for 1h. Alexa Fluor® 594 WGA was used to label plasma membranes (red). DAPI was used to stain the cell nuclei (blue). This antibody also gave a positive IF result in HeLa, HEK 293, MCF7 cells. Publishing research using ab17347? Please let us know so that we can cite the reference in this datasheet. there are 6 histone H1 isoforms in human. Which one is the immunogen derived from? Also, Reinberg's Molecular Cell paper says H1K26 is methylated. Is your ab against K25 or K26? Thank you for your enquiry. 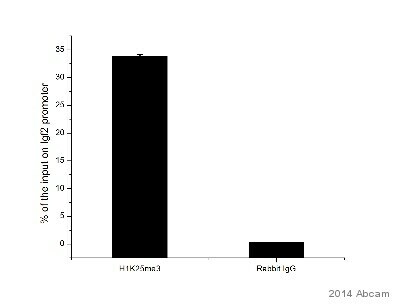 This antibody was raised against histone H1 (H1.4; SwissProt reference P10412). This methyl-lysine is referred to as K25 and K26 in the literature. This is confusion originating from the inclusion of the methioine in the published sequence. We refer to this as K25 but this residue is sometimes also referred to as K26. I hope this information helps, please do not hesitate to contact us if you need any more advice or information. Thank you for getting back to me. Yes, I would very much appreciate it if you could provide me with your blots. However, what would be more informative would be if you could determine the result by western blotting using histones methylated by G9a and 14C-SAM. This will provide us with an idea of whether this antibody does indeed recognize methylated histone H1. If you provide me with your original purchase order number and date of purchase I will happily issue you with a replacement vial. I would also like to know whether you are interested in licensing your anti-methyl K26 histone H1 antibody through ourselves at Abcam. I look forward to hearing from you.